Deborah Di Bernardo, owner of Roast House Coffee, only uses organic, fair trade, shade-grown coffee. A good cup of coffee can be more than just a morning wake-up habit or afternoon caffeine jolt. It can be the source of community, as people gather at their favorite java joint. And in some hands, it offers opportunities to educate people about the planet's health and how we affect it with every decision we make. Even the decision of what coffee we drink. 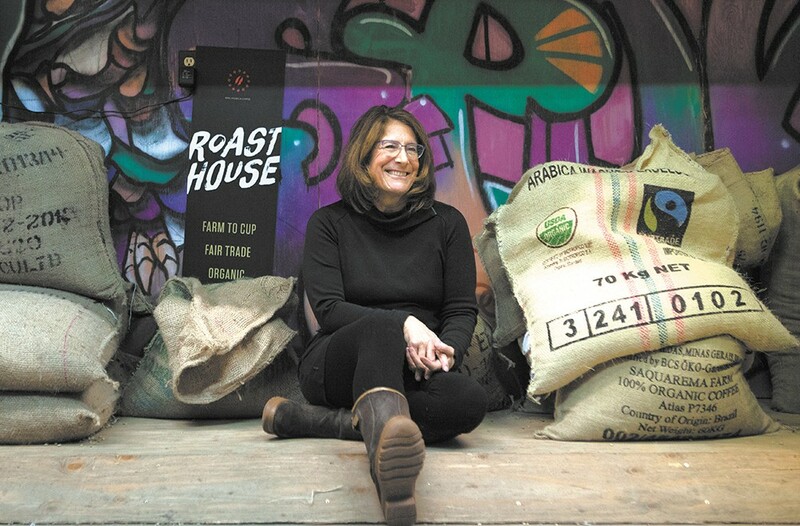 Consider Roast House Coffee's Deborah Di Bernardo a coffee evangelist of sorts. After years in the food industry, she started Roast House intent on creating a company that did business the same way she lived in her personal life — organically, sustainably, and supporting local businesses along the way. The result is a Spokane-based roaster doing coffee that is 100 percent organic, shade-grown and Fair Trade-certified. A previous gig at Thomas Hammer Coffee Roasters led Di Bernardo to dive into all aspects of the industry, and what she found reading and attending conventions was disheartening, particularly how damaging industrial coffee farming can be to the earth, and to the people working the land. "I started learning where the coffee's coming from, how little the farmers are making, how it's affecting the environment," Di Bernardo says, standing in the midst of her roastery where everything from the office furniture to pallets to the roasters are reused and recycled. "When I opened this, I was committed to sustainably grown, more direct-relationship coffee. Coffee where we knew the farmers, where we've been there, we could taste it. Or my importer has boots on the ground all the time." Di Bernardo's desire to create an earth-friendly company comes at a cost. Less than 1 percent of the world's coffee is grown in its natural shaded environment rather than on sun-soaked coffee farms, so it costs more to import those rare beans. She figures she pays twice as much for her labels in order to use a local printer, rather than simply ordering them online. Her coffee bags are all compostable, and that costs, too. For Di Bernardo, though, any increased cost is worth what she's able to add to both the local economy and the world beyond. It's summed up in a story she tells about one of her importers approaching her about buying beans from the Congo, a country she'd never heard of producing coffee. "They said, 'Yeah, that's because of 20 years of genocide, there's only women and children survivors, and they haven't been able to export it, and they're starving,'" Di Bernardo recounts. "'And there's a nonprofit stepping in, and they're not just feeding them, but they're creating a safe zone. And if you buy this coffee, you'll be directly supporting them.' I'm a soft touch, but come on! Children are starving!" She bought a 140-pound bag, and realizing that the Congolese coffee wasn't quite as robust as most locals like to drink, she worked with local chef Adam Hegsted and created a blend pleasing to local tastes, and now served at the Wandering Table, the Yards Bruncheon and some other area restaurants. That kind of collaboration on the local level, and its ability to make global change, is what keeps Di Bernardo going through the travails of small-business ownership, as well as a recent breast-cancer battle. She is someone who loves talking about how we can all make changes in our lives, together, in the Inland Northwest, that can have big effects far beyond our own backyards. Often that conversation starts online, where she's a devoted social-media marketer of Roast House's coffee and philosophy, or with her showing up at a community event, fresh coffee in hand, offering samples of her brew. She figures she gives out about 10,000 free cups of coffee each year. "This fosters a conversation," she says. "When somebody is sipping on something, they're calmer, they're more receptive to a gentle conversation" about the loss of coffee-growing forests, the importance of buying local and how we can all fight climate change with the choices we make. "I'm never going to change a large percentage of the population's opinion or affect their ideals," Di Bernardo says. "But hopefully talking to thousands and thousands I talk to, and they talk to thousands and thousands, and hopefully they're all movers and shakers."